"I know that everyone was cheering for Serena Williams and I'm sorry it had to end like this." Tears were streaming down Naomi Osaka's face in Arthur Ashe Stadium in September. She had just won her maiden grand slam at the US Open. 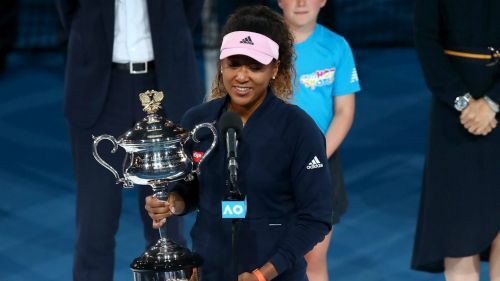 But they were not tears of joy as she sensationally apologised to the New York crowd, who had jeered the beginning of the trophy presentation. Osaka's moment in the spotlight was cruelly taken away in the midst of Serena's epic meltdown during the contentious decider. Her emotions carried over into the post-match news conference. "I know she really wanted to have the 24th Grand Slam," Osaka told reporters. "Everyone knows this. It's on the commercials. It's everywhere. But when I step onto the court, I feel like a different person. I'm not a Serena fan. I'm just a tennis player playing another tennis player. But then when I hugged her at the net…"
Osaka was the unfortunate villain at Flushing Meadows. However, fast forward four months and the big-hitting fourth seed was back on the biggest stage with the chance to enjoy her finest moment at the Australian Open. The Japanese sensation put on a memorable spectacle with Petra Kvitova, who had her own story to tell - the victim of a terrifying home invasion that left her playing hand horrifically mangled and career up in the air. Saturday's women's final had it all. Aces, thrilling baseline rallies, crisp winners, twists and turns, and even some unexpected rain in a battle of the big hitters in Melbourne. But the 21-year-old - the youngest world number one since Caroline Wozniacki (20) in 2010 and the first female or male Asian to be top of the rankings - showed why she is the new face of women's tennis. The first woman since Jennifer Capriati in 2001 to follow up her debut slam win by claiming the next one, and the first woman to secure successive majors since Williams clinched the 2014 US Open followed by the Australian Open, French Open and Wimbledon in 2015. There were no apologies as she received the Daphne Akhurst Memorial Cup and collected her prize cheque. Osaka finally had her magic moment.